The flower business is an early morning affair. 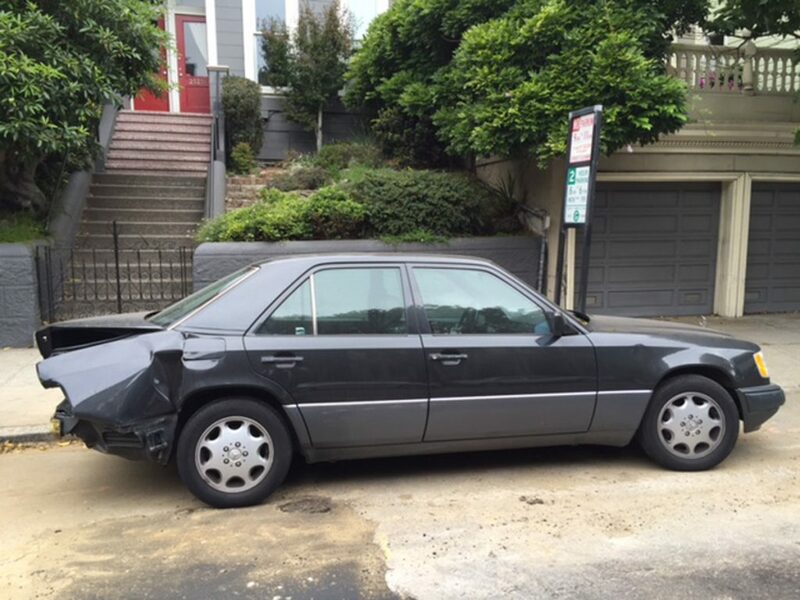 My morning usually starts with an espresso at Jackson and Fillmore, then a short hop past Alta Plaza Park to work at Bloomers at 2975 Washington Street. Opening the door, I’m met with the fragrance of fresh flowers and the aroma of more strong coffee brewing in the back room. The crew is already at work trimming, cutting, cleaning, putting flowers into water and setting up the store for another day of business. Presiding over all this industry, as he has since 1977, is owner and proprietor Patric Powell. 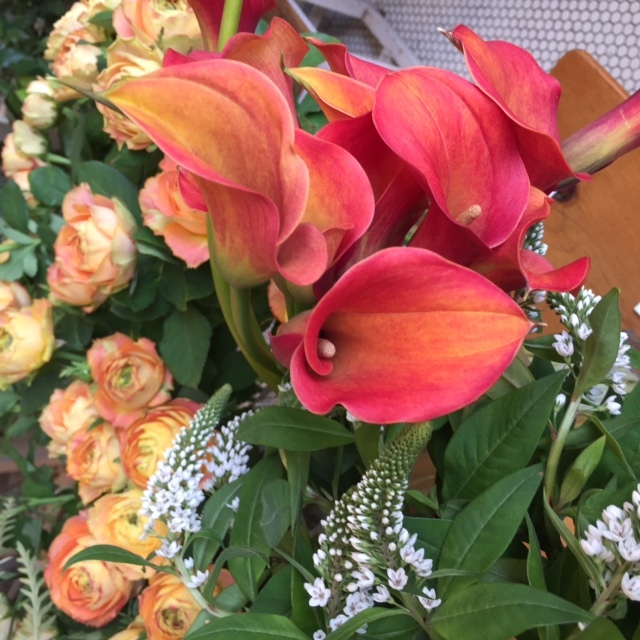 This year the venerable Pacific Heights florist is celebrating 40 years of flowering. That alone is a real accomplishment — a thriving small business with a rarefied and fragile product in an expensive city of fickle taste. 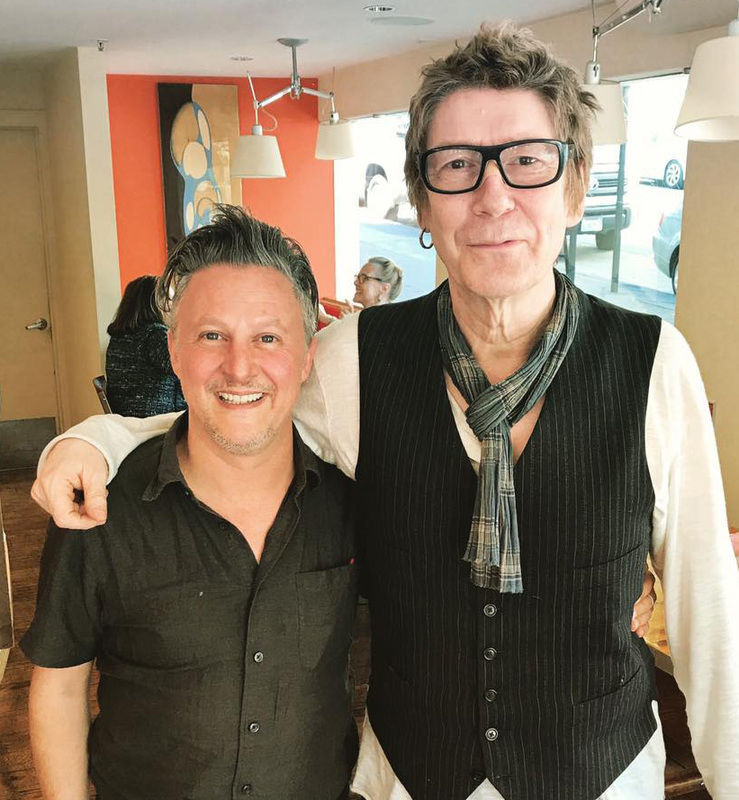 Mark Fantino and Richard Butler of The Psychedelic Furs at Chouquet’s. Turns out, I know him well. He’s the lead vocalist of The Psychedelic Furs, one of my favorite rock bands. A benefit of being a record collector who scrutinizes every detail and reads all the liner notes and lyrics on all the records that shaped my life is that I have names memorized, as if they are all old friends who’ve seen me through thick and thin. I’m remembering the adage that we should know the names of the people who changed the world, or at least made it a better place. For us early morning folk, the long awaited opening of Blue Bottle Coffee on the busy Jackson and Fillmore corner is a blessing. In my mind, a strong cup of coffee is always a good thing, any time of day. That bracing dark, sweet shot of warmth and energy is one of life’s simple pleasures. Sometimes it’s also a necessity, a predictably effective motivator if I am going to accomplish anything the rest of the day. We in the Jackson and Fillmore pro-coffee faction mourned the day the friendly, patient staff at Tully’s closed their doors. Once a beacon of light, warmth, and caffeine — especially in the winter months — the corner remained dark for two years. 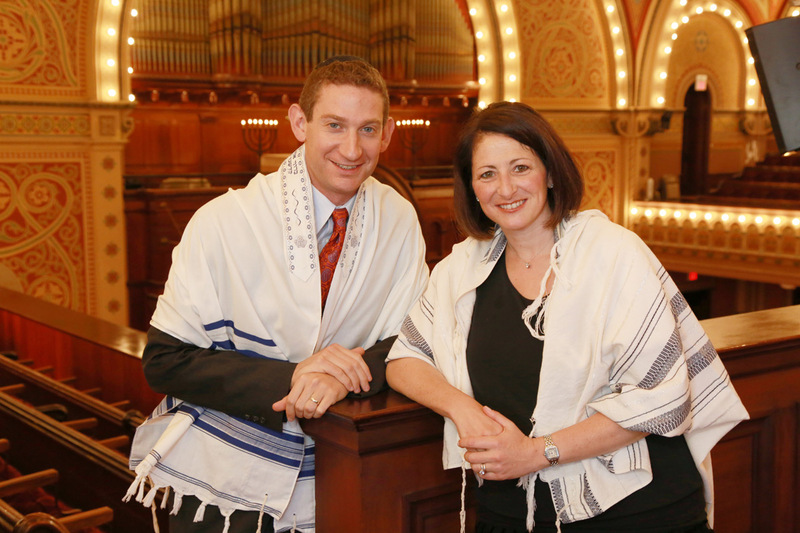 I would often see members of our tribe looking wistfully at the closed doors and the posted notices on the papered-over windows. It was especially difficult this last very cold and very wet winter. Sloshing through puddles to a distant cafe early in the dark morning was not an ideal way to start the day. I would occasionally catch the eye of a former Jackson-Fillmore regular scurrying up the hill with soggy paper cups and trays. 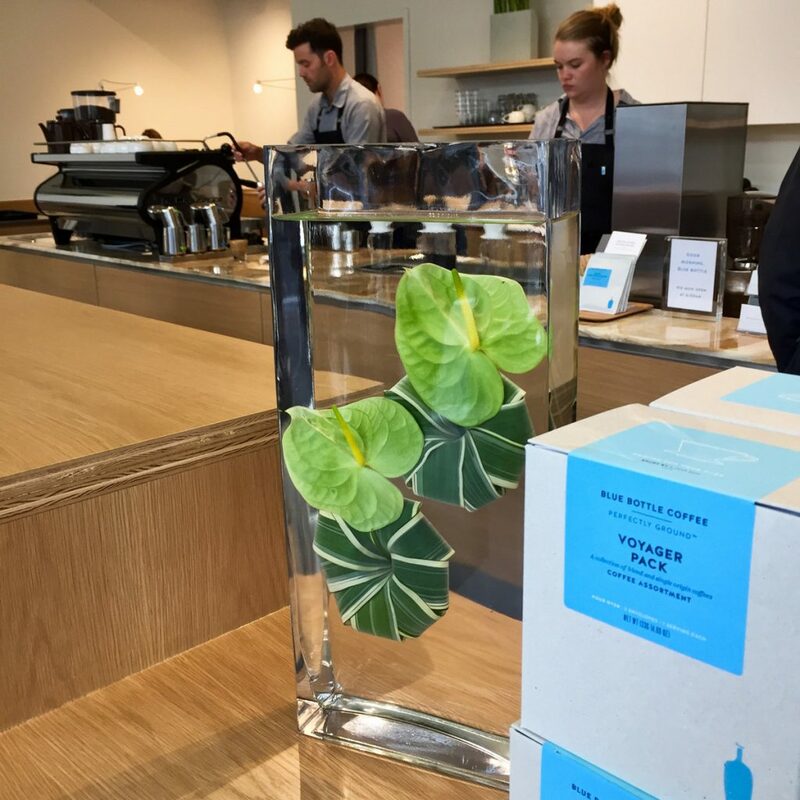 When the sparkly new Blue Bottle Cafe opened, I saw many of those same folks standing patiently in the line, looking relieved, and eager to enjoy the much-acclaimed coffee. The cafe is modern, bright and open, with wrap-around windows to watch the comings and goings on that lively intersection. The cheerful staff seems eager to make friends of all the neighborhood folk. And those meticulously prepared espressos and macchiatos and pour overs are are gradually clouding my memory of the long wait for that early morning elixir. Truth be told, they take a little too long for me, at least most mornings — but damn, it is mighty fine coffee! The third Age March takes place on December 4 on Union Street in San Francisco. 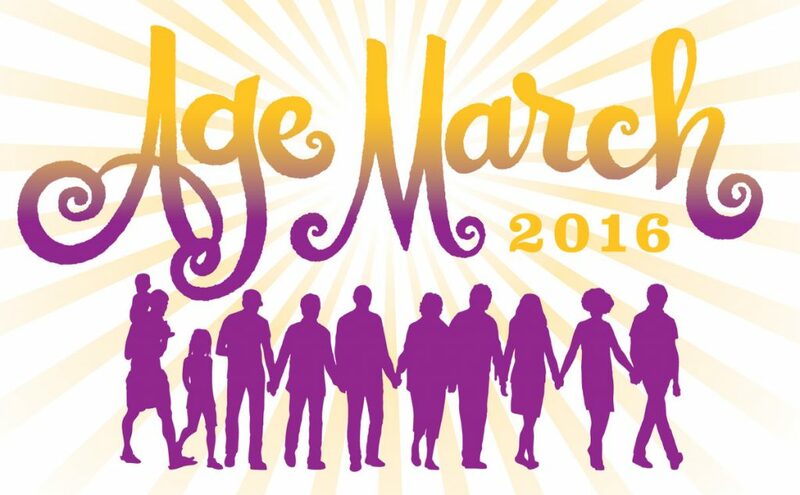 My idea for an Age March began with a dream. 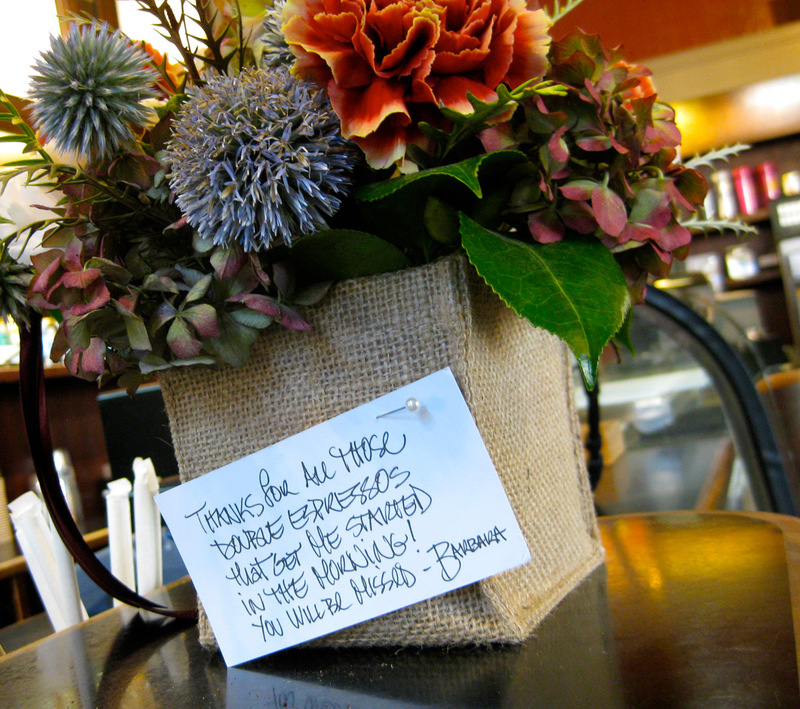 Flowers for the Fillmore-Jackson coffee shop when it closed in 2014. Funny how habits form. They revolve around responsibilities and chores, but also the small pleasures that brighten our daily routines. I have been working for several years at a beautiful flower shop in the neighborhood. 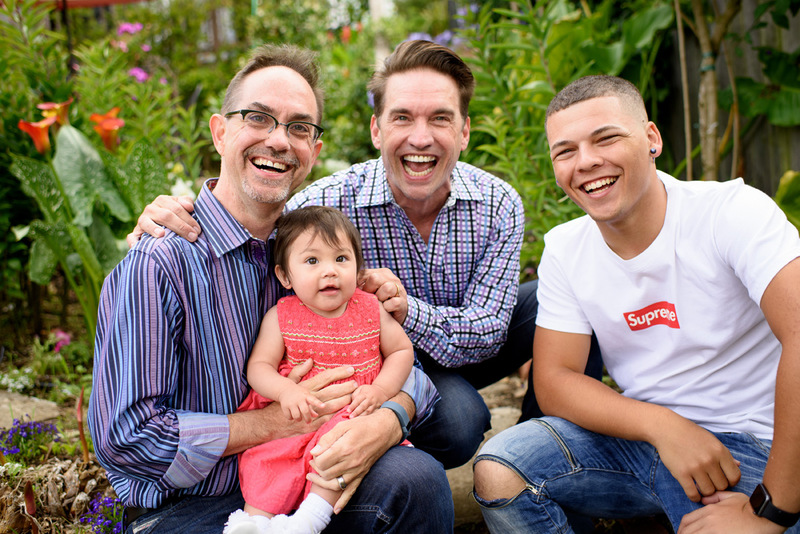 In addition to spending time with a great team of co-workers and the lovely flowers every season and every day, it includes a relatively pleasant bus trip over from my Russian Hill apartment. Florists start early, so it’s usually the coldest part of the day, and in the winter it’s dark. Very dark. But at the corner of Fillmore and Jackson was the welcome light of the coffee shop and the aroma of ground beans and steamed milk — and those friendly baristas who knew exactly what I wanted and just how I wanted it. 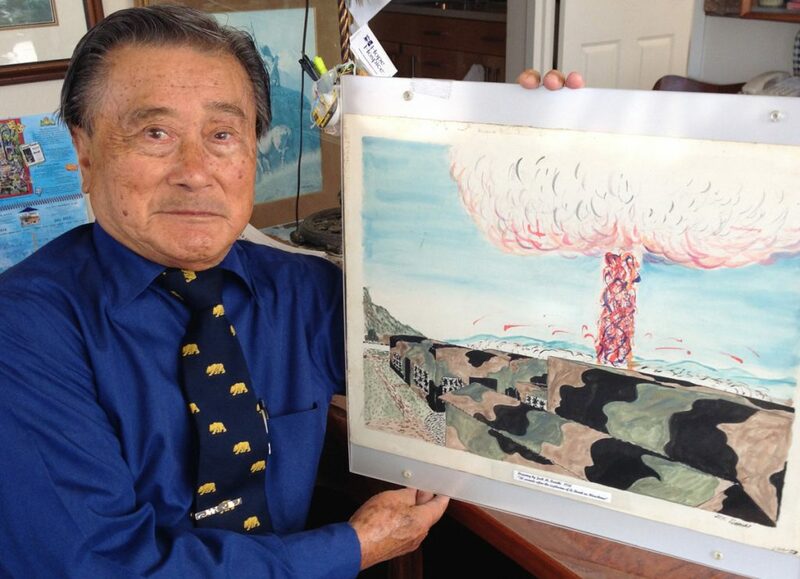 Jack Dairiki with his painting of Hiroshima 30 seconds after the atomic bomb exploded. In Hiroshima City’s Atomic Peace Park, there is a poem carved into a rock that states: “Please rest in peace, for this error shall never be repeated.” It is a pledge to all living people of the world to protect all of humanity. I witnessed the holocaust three and a half miles from the atomic bomb detonation point. I traveled to Hiroshima, Japan, in August 1941 with my father on a summer vacation to visit my ailing grandfather. Unfortunately, we were stranded there in September of that year. Finding no passage to return to Sacramento, my father and I were separated from my mother and four siblings, who were interned in the camps at Tule Lake, California; Jerome and Rowher, Arkansas; and, finally, Amache, Colorado. My classmates and I were conscripted to work for the Japanese war effort at Toyo Factory. I was a 14-year-old student. We worked there from January 1945 until the atomic bomb was dropped on August 6. On that fateful day, because of air bombing raids, my commuter train to the Toyo Factory was delayed by 15 minutes. That delay saved me and my classmates from being in Hiroshima City. We were taking roll call at 08:15 when the bomb was detonated. We noticed three B-29 bombers traveling toward Hiroshima. It was shortly after that sighting that we experienced the horrific explosion of the first atomic bomb. First, there was a blinding flash and a horrific blast of wind that took out 99 percent of the Toyo Factory windows. I felt my body being lifted by this wind. When I opened my eyes, I was in the midst of dust and smoke and could not see my hands. Then I heard a fellow student run toward the bomb shelter a few hundred yards away; the entrance was at a higher elevation. Perhaps 30 seconds had elapsed. I looked back at Hiroshima and saw the monstrous fire column rising thousands of feet into the air. The whole city was on fire, covered in smoke and fire with no buildings to be seen. An hour later we peeked out from the cave shelter and witnessed the first victim: a young woman walking with her arms extended, her ragged clothes hanging from her arms and her hair burned off. She was looking straight ahead and walked like a ghost. 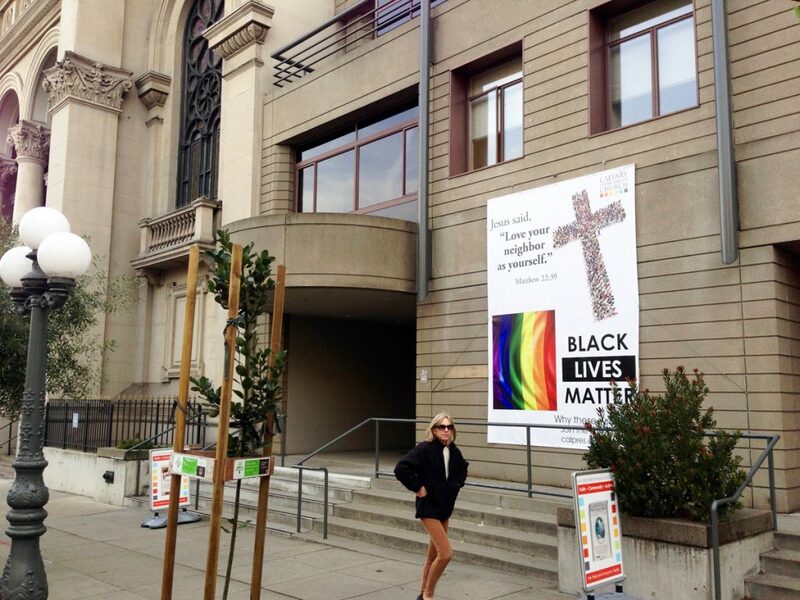 We noticed as she came closer that it was not burned clothes, but her skin, hanging from her arms. We were instructed to return home if we were able to walk. I boarded a ghost train with the paint burned off and windows shattered. Inside the train were many injured people asking for medical aid. I could not help them, so I dismounted the train to walk home, a distance of 10 miles. My grandmother welcomed me — she was scanning the horizon for my return. The house was not damaged, except that all the sliding doors were down but unbroken. There were 55 hospitals, 200 doctors and 2,000 nurses in Hiroshima City before the bombing. What remained were three hospitals, 20 doctors and 170 nurses to help the wounded. There were 80,000 people who died near me in the city. I can never forget the image nor the smell of death.